July — 2012 — St. Finbarr's A.C. Reminder for those doing Dublin Marathon 2012 – entry fee is currently €70 but increases to €80 after 5pm on Tuesday 31 July. Denis Coughlan had a fantastic run in the 800m at the Morton Games on Wednesday when he ran a pb of 1.56.12. Denis was just beaten into second place in the race. Congrats on a great run Denis! At Barretstown we help to rebuild the lives of children affected by childhood cancer and their families, through a life changing programme of Therapeutic Recreation, which is entirely free of charge for families; food, accommodation, transport and medical expenses are included. You can contact Barretstown at bernie.connell@barretstown.org or phone 045 863134. Cathal O Donovan ran another pb in the Carrigtwohill 5k on Wednesday, 18th July, 2012. On a nice evening Cathal ran 15.33 to finish third in a competitive race held on a testing course. John Meade was 5th while Cathal O Connell was 9th (1st M45) and Rob Patterson was 10th. In the ladies race Geraldine O Shea was 4th and Michelle Nolan 5th. There was a large Barr’s contingent on the night and well done to everyone who ran. In the Donoughmore 7 mile race on Friday 20th July, 2012 John Meade was 2nd and Cathal O Connell 3rd while Michael Morgan was 5th and Dennis Lyons 10th. In the ladies race Claire McCarthy was the winner in 42.12 with Karina Teahan finishing 3rd and Gillian Cotter 4th. St Finbarr’s AC are pleased to announce that this year’s John Buckley St Finbarr’s AC Cork Half Marathon will take place on Sunday the 9th September 2012. The race will also incorporate the Cork and Munster Half Marathon Championships. The race head quarters will be the Blarney GAA club house, and the race will commence at 11.00. Entries are now been taken for this event which will be run on a faster, flatter course than last year. See course and full details under Half Marathon 2012 tab. 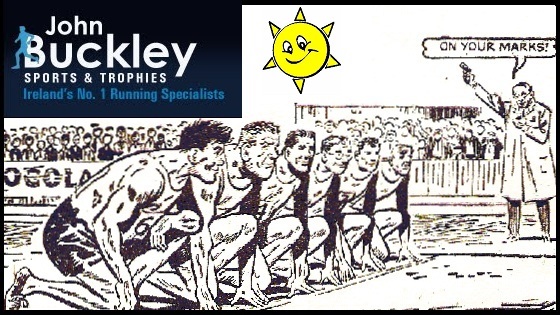 The fifth John Buckley Sports Graded T&F Meeting of 2012 takes place on Sunday, July 15th, 2.30pm at the CIT Track. The centre piece of the meeting is the 5000m. For the remainder of the graded league, the action moves from a Friday evening to a Sunday afternoon time slot with an extended schedule of T&F events. The graded meetings are open to athletes of all levels of ability from any club. Entry is €5.00 on the day and you can do as many events as you like. What about the Relay? Cathal O Donovan continued his brilliant recent form with a fantastic performance in this hard 5k. He ran a pb of 15.55 to win well on course with a nice hill that you have to tackle twice. This was Cathal’s 7th win in a row and he seems to be going from strenth to strength. Well done Cathal! Cathal O Connell was 4th (3rd registered runner) home in his first race since his Cork Marathon performance and he followed this up with a 3rd place in the Corkbeg 4mile race the following evening! With a large Barr’s contingent running on a warm evening there was a lot of category winners from the Barr’s so congrat’s to all of them and all other Barr’s runners! Please be advised that this Friday nights 10km road race in Ballinascarthy has been postponed due to flood damage in the village. The organisers aim to reschedule the event for later in the year.